This column is about a childish, spoiled football player who doesn’t know how wonderful he’s got it; and about the song that has inspired his nonsensical raving and disrespect of a national symbol. 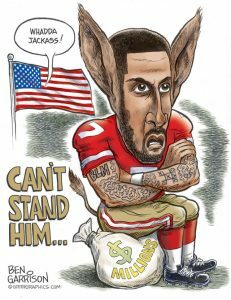 Colin Kaepernick, did you feel that you weren’t getting enough attention as the (substitute) quarterback for an NFL team? Did raking in multi-millions every year for playing not all that much, not make you feel enough like a big, bad dude? Did your mulatto racial make-up (black father, White mother) leave you confused and upset about who and what you really are? Or was it just the usual politically correct crap about “racist America” that led you to refuse to stand for the national anthem? Is that what a lot of young, not too bright guys like you think is “hip” or “morally superior” nowadays? Disregarding for the moment the fact that your ancestry is half Caucasian (like Barack Obama’s), do you think the African half of that ancestry would be better off now if no Arab slave traders had purchased your paternal ancestors from tribal chieftains in Africa, possibly several hundred years ago, and shipped them to America to be sold as slaves? THINK ABOUT THAT, Mr. Kaepernick. If they hadn’t, instead of having had all the advantages you have as an American, including having been raised by a loving White couple after your mixed-race parents abandoned you, you’d be living on the poorest, most disease-ridden, least educated, lowest IQs continent on the planet — Africa. How does that sound, Jake? Not so good, huh? If I owned the NFL team where you, and a number of your teammates who have aped (pun intended) your anti-American actions, make your multi-million dollar salaries, I’d bench all of you until you agreed to honor the flag as all good Americans do, and fine you a large sum each day until you did it, to boot. Now for the second half of this column, which I’m sure certain people will label as “racist” after reading the first part of it (go ahead, folks; I couldn’t care less). It’s the national anthem, “The Star-Spangled Banner,” itself, that I’d like to talk about. Yes, the song, written by Francis Scott Key in 1814 depicting what he saw during the battle of Washington, D.C., during the War of 1812, is noble, describing in memorable words an incident in American history in which the enemy tried repeatedly to bring down the American flag over the Yanks’ redoubts — but failed every time. The flag kept flying; America survived. BUT AS WRITTEN, the melody of the song is extremely hard to sing, unless you have near-opera diva abilities. At the start, it goes from fairly high, to suddenly low, then up into the stratosphere again. As the verse starts, “And the rockets’ red glare …”, I have heard singers who performed the song at monster sports rallies, have to drop down into a lower octave because they couldn’t get up to the high notes. And in the last stanza, the melody line goes up so high that it’s very hard for many singers to reach. Which is, I guess, one big reason that we have our national anthem sung by a single professional songster at major public events, while the crowd of thousands stands like a collection of wooden Indians, silent as the grave. Actually singing the anthem would be far beyond the ability of many, many Americans. Go on YouTube and google, “National anthems.” You can hear many of them on there, in separate video clips. Many are beautiful, especially “La Marseilles,” the French Revolution song, and the Russian national anthem, which is I think the most stirring one I’ve ever heard. How are they different from “The Star-Spangled Banner”? Well, for one thing, they sound to me as if they are easier to sing. Not as many sudden leaps clear over the moon in the melody. Also, usually, better, smoother rhythm. That of our anthem is … well, awkward. And if you’ll notice on the videos, the other national anthems are nearly always sung by large audiences or stadiums full of sports fans, in unison. In my book, that’s how a national anthem SHOULD be performed. After all, it shouldn’t be about a solitary singer (often black, nowadays), playing tricks with the melody as if it was a Motown R & B song from the 1960s. It’s not about how many times the singer can get the audience to go, “Oooh!” and “Aaah!” at his/her version of “The Star-Spangled Banner;” it’s about our national anthem. And then there’s the song that I believe many of us would choose, if we had the opportunity: “God Bless the U.S.A.,” by Lee Greenwood. Try to sing it, or listen to it, without getting a lump in your throat. I can’t. Well, that’s it, Mr. Kaepernick. I hope you read, and learned something, from this column — mainly that you are among the blessed in the U.S.A., and that refusing to honor your nation’s anthem by standing, simply makes you look like a privileged, spoiled child. And that maybe we should consider a change of songs. Another memorable column, Old Corporal. We enjoyed it very much. Hard to fathom that idiot getting by with sitting through the National Anthem! Thank you, good friend. If you go to the story from earlier, about “Black people having another ‘pity party’ ” you’ll see those nasty comments that person left. Just in case you want to read them.